The agent concerned is one of the worst for overvaluing. Another agent has taken a double page spread, filled it full of houses they've sold (stc only though!) to promote the message they've achieved sales where over agents have failed. No doubt their method of success is putting a sensible price on the property. Seems the message is now getting through to the agents that if you want to survive you need turnover. 130k for 2 bed flat. Not quite at bargain price yet! What's typical for that in Bromsgrove. Wouldn't have thought that much? Nice thoughts though, overvaluing EAs just can't sell - chase market down, whilst realistic ones do. Come back in three years when that is on the market for 65k. These two bed flats with no storage, small bathrooms and kitchens, insufficient parking and whopping monthly service charges are going to plummet. It's quite clearly still preposterously overpriced. Last week I overheard a conversion in a pub in Purley about house prices. A nice enough (though bit chavvy) girl was saying to her mate how she's had to reduce the price of her 'townhouse' in Tatsfield (Surry/Kent border) from 299k at the beginning of the year to 245k and she can't go any lower as then she'll be unable to move. So much for the booming housing market in the home counties. Apart from banksters and a few wealthy foreigners buying in C. London, the bounce has been nought but a mirage. No i think that there was a bounce , she might not have sold for certain reasons , but the bounce did happen. However it has fallen off a cliff now. Was told from a very good source someone who works for the company that one of the major housebuilders in the country , will not name them but they are country wide and must have two hundred sites across the u.k. that last week in the whole of the country across the whole of their sites they sold just six houses. i would be extremely surprised if haliwide didn't average over 1% down, even 2% down, when the next data comes out. Do banks realise that most of the new builds are crap, with no room, no space and tiny garden? Do they also realise that 350k should be more than enough for a house price? Many new builds have been sold recently under the various government schemes , either part buy part rent, buy 70% now the govenment puts 15% in and the builder the other 15% in five years the buyer has to remortgage and pay the 30% back. What is going to happen when the new build that is over priced at time of build is reassesed for mortgage purposses and worth a lot less than the headline price today. I think in a few years time we will be seeing the documentries on the telly about how these schemes have turned into a nightmare for the buyers. Another labour time bomb waiting to go off. I viewed a house last weekend. Was on the market for 340K. Ceiling price in the road was 277K. I asked estate agent politely how he could justify the 340K price - He told me it was the vendors price, not his valuation. Guess vendor wont sell that place then. Yep I agree with you.. that the same in France too..
No i think that there was a bounce , she might not have sold for certain reasons , but the bounce did happen. You're right, but it seems to have been uneven. I can't speak for the home counties but I managed to sell my house in Cambridge a few months back for a few percent above what I got offered for it in 2007. However, I have friends in other places who've sold for well below what similar houses went for at the peak. 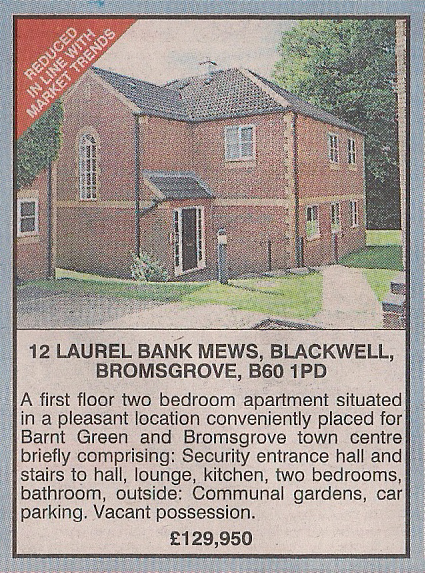 Believe it or not this price is average for Bromsgrove and good for Blackwell (which would have a Barnt Green/Lickey weighting in the price). Think that it may have something to do with the area being popular with downsizing retirees. £84,950 The Express Estate Agency offers ATTRACTIVELY PRICED PROPERTIES to buyers who are in a position to buy relatively swiftly. All of our properties are PRICED LOW to encourage a quicker than normal sale.